If there’s one thing that most gamers can agree on (and there’s certainly not much! 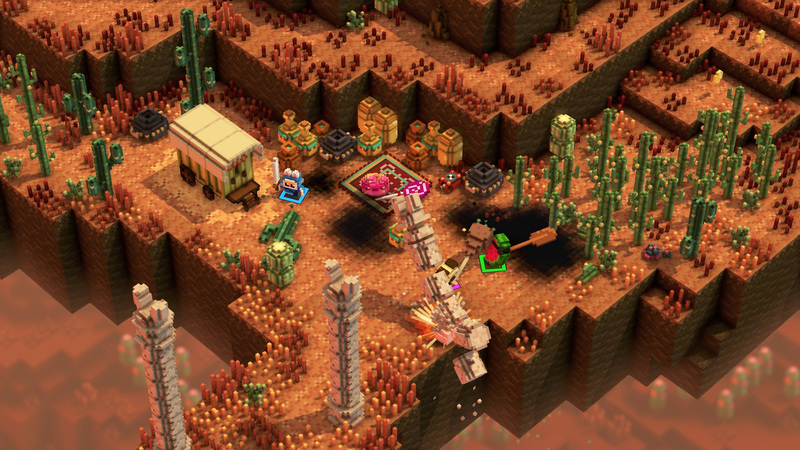 ), it’s that there aren’t enough four-player couch co-op games to choose from these days. Developer Cococucumber thinks they have the right idea with their upcoming co-op dungeon crawler, Riverbond. We were able to go hands-on with the game at last weekend’s PlayStation Experience 2017 in Anaheim, California, and it left quite the impression. Riverbond has an art style that is familiar, yet distinct. 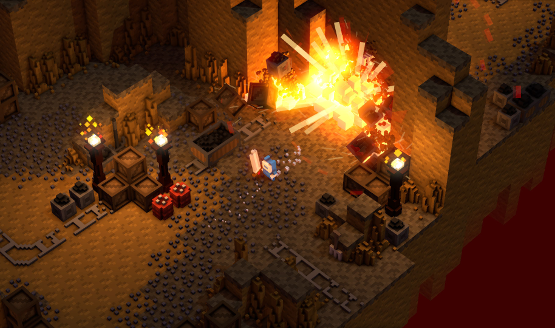 Unity is the game engine driving the graphics, but with some custom voxel plugins to enhance the visual style of the game, and allow for things like destructible environments. Comparisons will no doubt be made with Minecraft, and while there is some similarity between the two, part of Riverbond’s uniqueness comes from its character design. Combat plays a much more central role in Riverbond, and as such characters’ weapons are larger-than-life. Cococucumber has really gone overboard with their character designs, but in a good way. Riverbond’s pixel art style lends itself well to creating silly characters, since the blocky aesthetic isn’t too dissimilar from building with LEGO blocks. Regular knights might be a valid player option, but then again so will doughnuts. Why choose the regular, boring human when you could be a yummy slice of bacon instead? It’s too funny to pass up, really. Playing Riverbond is very easy to grasp. The left stick moves, X jumps, square attacks, circle rolls out of harm’s way, and R1 performs a special move which has a cooldown. As areas are cleared, treasure chests can be found. Most chests award everyone playing with something new, such as a new weapon. During our demo, we picked up drumsticks. As mentioned, weapons are exaggerated in size in Riverbond, so some of us were playing with gigantic drumsticks taller than our characters, all in glorious pixel art form. The co-op affair also features some friendly competition. Riverbond tallies up points in each round, showing a total score at the end. Beyond that, smaller chests scattered throughout each level will sometimes reward only the player who reaches it first, though larger chests that reward weapons are unlocked for all players at the same time. This ensures that those who like to bring up the rear of a party aren’t left with nothing to show for their efforts. Co-op play is also drop-in, drop-out, so if someone needs to leave to, I don’t know, feed a kid or something, they can do that without fear of being left behind or making everyone else wait impatiently. To top things off, Riverbond features a “heroic narrative,” so if you can’t find a group of friends at the moment, playing through some of the story might be what you need as you save the world while playing as a slice of watermelon. It’s all nonsensical, but all good light-hearted fun as well. The difficulty will also scale based on the number of players in the game, and the relative power of currently equipped weapons. Solo speedrun with a massive meatstick, anyone? Cococucumber is hoping to fill a niche that has remained relatively void for the past couple of generations of video games, namely couch co-op. What was played at PSX 2017 showed a lot of promise. I am fairly confident in saying that Riverbond will no doubt be a fun game when playing solo, but even more fun in groups. Running through a story with up to three other players is usually a recipe for a good time, and Riverbond appears to be on track to deliver just that when it launches in 2018. Riverbond PS4 preview conducted at PlayStation Experience 2017.